Many voices are speaking out about the Republican effort to undo the Affordable Care Act, but one party diligently refrains from public comment: the insurance industry. While the industry is undoubtedly exerting its influence in the closed-door negotiations to restructure the wildly unpopular GOP bill, it is not airing those views more widely. It doesn’t have to, because the healthcare debate between the two major parties is largely a disagreement on how best to serve the needs of Aetna, Anthem and the other big players. The ACA, of course, was built on the premise that government should expand coverage largely by providing subsidies to help the uninsured purchase plans from private companies. 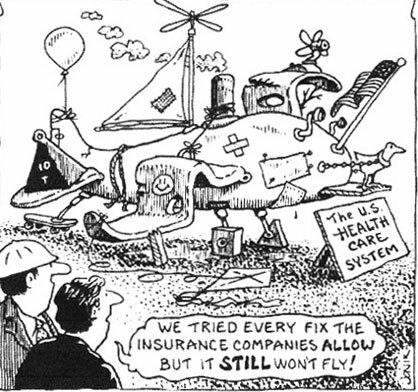 When those companies became dissatisfied with the composition of their new client base and starting jacking up premiums in response, ACA supporters were put in the position of advocating for new insurer financial incentives. Meanwhile, the Republicans are seeking to help the industry by rolling back Medicaid expansion and allowing it to return to the pre-Obamacare practice of selling bare-bones junk insurance, which would be the only kind that many people could afford after subsidies are decimated. This is probably a no-lose situation for the insurers: either they get paid more to provide decent coverage or they are freed to sell highly profitable lousy plans. All those legislators catering to insurers one way or the other are forgetting that healthcare reform was made necessary by the ruthless behavior of that same industry. If those companies had not been denying coverage whenever possible, it would not have been necessary for the ACA to set minimum standards. And if those firms had not been raising premiums relentlessly, it would not have been necessary for the ACA to take steps — which turned out to be inadequate — to try to restrain costs. The industry’s unethical practices are not limited to the individual marketplace. The big insurers have also exploited the decision by policymakers to give them a foothold in the big federally funded programs: Medicaid and Medicare. As Senate Republicans were cooking up their repeal and replace bill, the U.S. Attorney’s Office in Los Angeles joined two cases against one of the industry’s giants, UnitedHealth Group. The whistleblower suits accuse the company of systematically overcharging the federal government for services provided under the Medicare Advantage Program. The complaints in the cases allege that UnitedHealth routinely scoured millions of medical records, searching for data it could use to make patients seem sicker than they actually were and thus justify bigger payments for the company, which was also accused of failing to correct invalid diagnoses made by providers. Either way, the complaints argue, UnitedHealth was bilking Medicare Advantage, which was created on the assumption that bringing the private sector into a government program would cut costs. Such assumptions continue to afflict federal health policy as a whole. Too many members of Congress continue to worship the market in the face of all the evidence that the private insurance industry cannot be the foundation of a humane healthcare system.